CHAMPAIGN, Ill. — Researchers have produced a "human scale" demonstration of a new phase of matter called quadrupole topological insulators that was recently predicted using theoretical physics. These are the first experimental findings to validate this theory. The team's work with QTIs was born out of the decade-old understanding of the properties of a class of materials called topological insulators. "TIs are electrical insulators on the inside and conductors along their boundaries, and may hold great potential for helping build low-power, robust computers and devices, all defined at the atomic scale," said mechanical science and engineering professor and senior investigator Gaurav Bahl. The uncommon properties of TIs make them a special form of electronic matter. "Collections of electrons can form their own phases within materials. These can be familiar solid, liquid and gas phases like water, but they can also sometimes form more unusual phases like a TI," said co-author and physics professor Taylor Hughes . TIs typically exist in crystalline materials and other studies confirm TI phases present in naturally occurring crystals, but there are still many theoretical predictions that need to be confirmed, Hughes said. One such prediction was the existence of a new type of TI having an electrical property known as a quadrupole moment. "Electrons are single particles that carry charge in a material," said physics graduate student Wladimir Benalcazar. "We found that electrons in crystals can collectively arrange to give rise not only to charge dipole units – that is, pairings of positive and negative charges – but also high-order multipoles in which four or eight charges are brought together into a unit. The simplest member of these higher-order classes are quadrupoles in which two positive and two negative charges are coupled." It is not currently feasible to engineer a material atom by atom, let alone control the quadrupolar behavior of electrons. 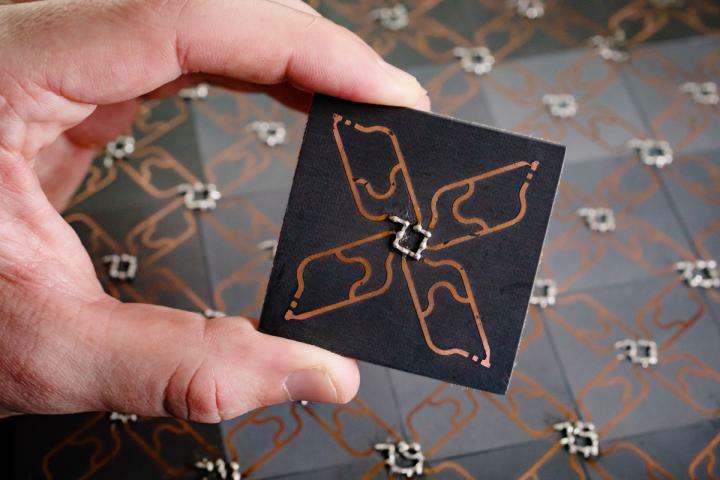 Instead, the team built a workable-scale analogue of a QTI using a material created from printed circuit boards. Each circuit board holds a square of four identical resonators – devices that absorb electromagnetic radiation at a specific frequency. The boards are arranged in a grid pattern to create the full crystal analogue. "Each resonator behaves as an atom, and the connections between them behave as bonds between atoms," said Kitt Peterson, the lead author and an electrical engineering graduate student. "We apply microwave radiation to the system and measure how much is absorbed by each resonator, which tells us about how electrons would behave in an analogous crystal. The more microwave radiation is absorbed by a resonator, the more likely it is to find an electron on the corresponding atom." The detail that makes this a QTI and not a TI is a result of the specifics of the connections between resonators, the researchers said. "The edges of a QTI are not conductive like you would see in a typical TI," Bahl said, "Instead only the corners are active, that is, the edges of the edges, and are analogous to the four localized point charges that would form what is known as a quadrupole moment. Exactly as Taylor and Wladimir predicted ." "We measured how much microwave radiation each resonator within our QTI absorbed, confirming the resonant states in a precise frequency range and located precisely in the corners," Peterson said. "This pointed to the existence of predicted protected states that would be filled by electrons to form four corner charges." Those corner charges of this new phase of electronic matter may be capable of storing data for communications and computing. "That may not seem realistic using our 'human scale' model," Hughes said. "However, when we think of QTIs on the atomic scale, tremendous possibilities become apparent for devices that perform computation and information processing, possibly even at scales below that we can achieve today." The researchers said the agreement between experiment and prediction offered promise that scientists are beginning to understand the physics of QTIs well enough for practical use. "As theoretical physicists, Wladimir and I could predict the existence of this new form of matter, but no material has been found to have these properties so far," Hughes said. "Collaborating with engineers helped turn our prediction into reality." The National Science Foundation and U.S. Office of Naval Research supported this study. The paper "A quantized microwave quadrupole insulator with topologically protected corner states" is available online and from the U. of I. News Bureau.